Staying in a hotel nearly every night of the year can get a bit tiresome. I know it’s just part of the job and certainly better than sleeping in the truck (probably the most frequent question I get asked). We typically stay at one of a handful of chains due to familiarity and services offered. Every once in a while I want a little change, to try something different. We have rented cabins, tried a bed & breakfast, and now we have stayed on a ship. This wasn’t a cruise, because the vessel doesn’t move. 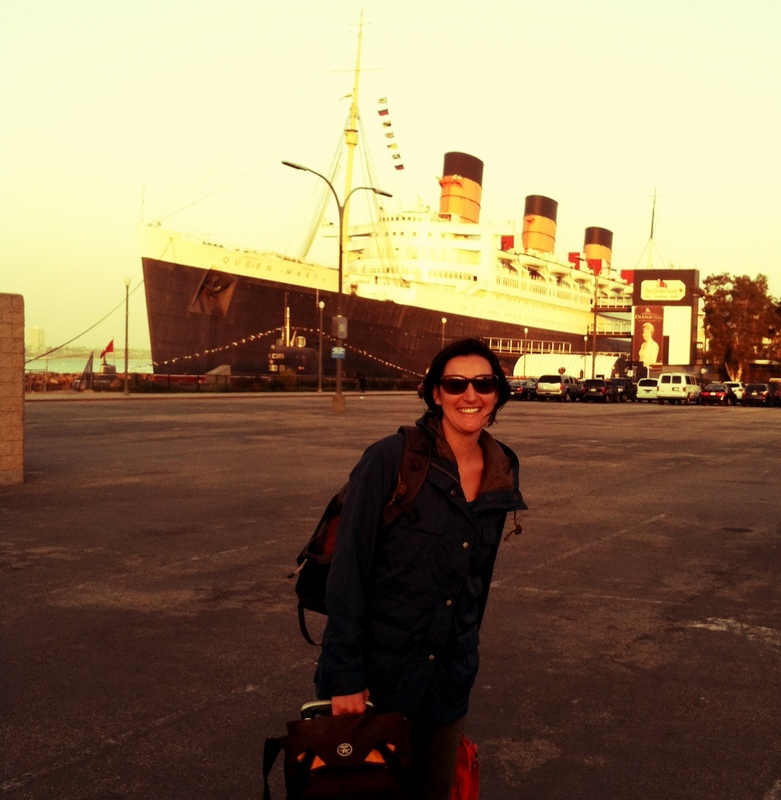 The Queen Mary once a luxury ocean liner is now a lovely historic hotel in Long Beach, CA. We had made plans to see the lovely Carrleigh, from Rocky Creek, and her mom Kat just before leaving California on our way back to the Southwest. Finding a hotel with truck parking can be a bit of a challenge at times, so you can imagine my surprise when I found out that the Queen Mary has a lot for oversized vehicles. We chose to step up our room from the lowest offered, why not right. It was very comfortable and very cool. 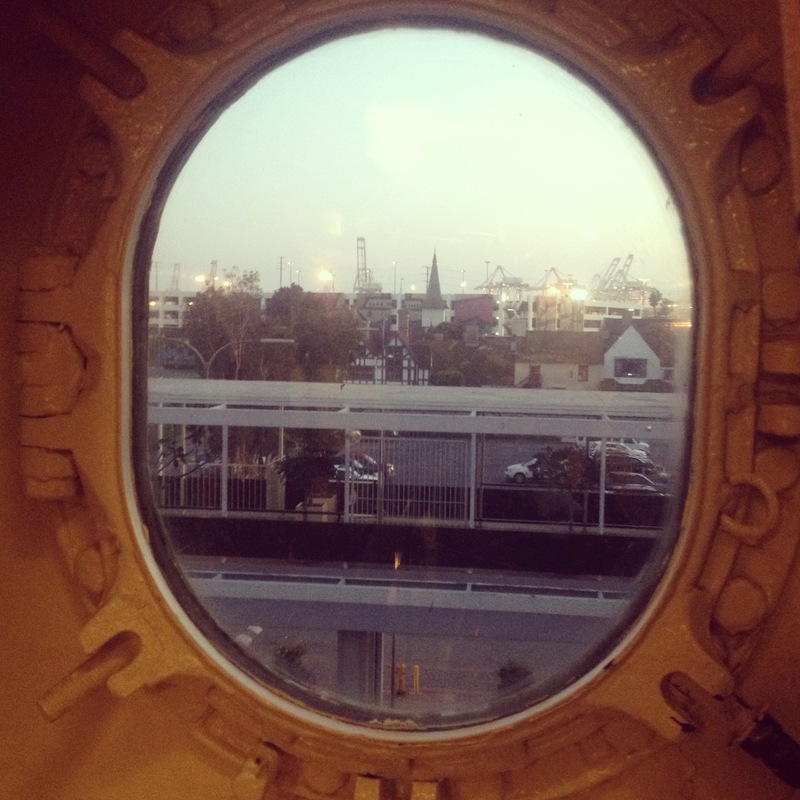 While the room didn’t face out in to the bay it did have porthole windows!!! After getting dressed up in some vintage inspired outfits, including red lipstick and a scottie dress, it was time to explore the ship. Oh did I mention they are dog friendly and Pippi was quite a hit. The ship was built in Scotland and is home to a Scottish Heritage Facility. We stopped to have a cocktail at the Observation Bar, a sweet little joint serving tasty concoctions. I left my red lipstick on the rim of a few flutes containing a French 75. After all that fun we figured dinner was on the list next. Due to private functions the only restaurant open on the ship that evening was their posh offering at the top deck. While it was delicious and the view wonderful I would have preferred something a bit more casual, but hey we were there to have fun. I’ll spare you the boring, yeah right, details about our evening with Kat and leave you with this. After filling our heads with wonderful music, plentiful laughs and possibly a bit too much booze, getting lulled to sleep with windows of our stateroom open was a truly awesome experience. We already can’t wait to go back. This entry was posted in Amazing Places, Life on the Road, Travel Life, Travel Tuesday and tagged California, life on the road, Long Beach, Queen Mary, Rocky Creek Scottie, travel, Travel Life, Travel Tuesday. Bookmark the permalink.